OUTER APPLY is not an alternative for LEFT OUTER JOIN, instead each of them have their own pros and cons. The general rule of thumb is you may like to use the OUTER JOIN if you want to evaluate/execute the RIGHT side table expression or Table Valued function for each row in the LEFT side table expression. Just to demonstrates how we can use OUTER APPLY operator with a very basic example, here in this example will re-write a very basic LEFT OUTER JOIN query by OUTER APPLY. From the above results we can see that the re-written OUTER APPLY query is returning the same result as that of the LEFT OUTER JOIN query. 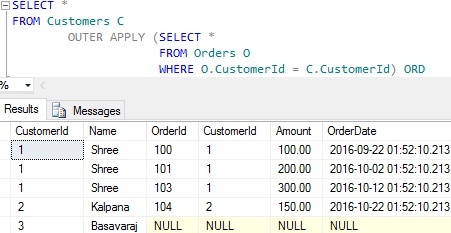 We can write a query like below using OUTER APPLY operator to get details of all the customers with their last two order details if it is present. 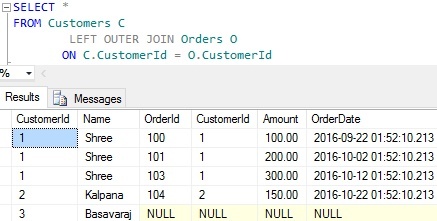 This query basically evaluates the function fnGetLastTwoCustomerOrders for each row in the Customer table by taking CustomerId as the input. From the result we can see that for the customer with customer id =1, we have two orders in the result even though this customer has three orders because the function fnGetLastTwoCustomerOrders returns at max the last two orders for any given CustomerId. And for CustomerId =2, we see only one order detail in the result as this customer has placed only one order till now and for the Customer with CustomerId = 3 in the result we can see only the Customer details and all the Order details columns value for this customer is NULL because this customer is yet to place any order. In the example 2 the RIGHT side of the OUTER APPLY operator was User Defined Function, this example demonstrates how we can have a Table Expression on the right side of this operator. 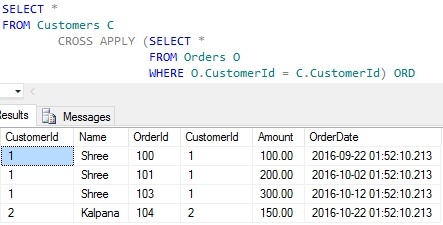 The below script can also achieve the same result as the example 2, but here we have not used the Table Valued Function fnGetLastTwoCustomerOrders instead we have used the derived table. 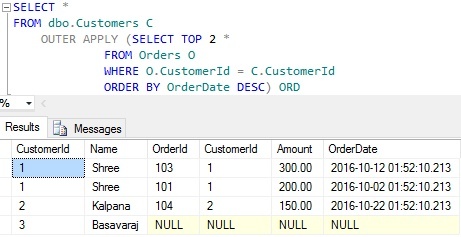 APPLY operator was introduced in Sql Server 2005. The main purpose of the APPLY operator is to JOIN a Table with a Table Valued User Defined Function. The APPLY operator invokes/executes the Table Valued User Defined Function for each row returned by the LEFT side table expression of the APPLY operator. APPLY operator can be used to join two table expressions just like any other JOIN operators. In case of APPLY operator, for each row in the LEFT side table expression of the APPLY operator the RIGHT side table expression is evaluated and final result can have the columns from both LEFT and RIGHT side table expressions just like in any other JOIN operations result. Unlike APPLY operator, classic joins like INNER JOIN, LEFT OUTER JOIN, RIGHT OUTER JOIN etc, doesn’t support evaluating a RIGHT side table valued function based on the column values of each row returned by the LEFT side table expression. In other words the classic joins works on the self-sufficient sets of data, where these sets of data doesn’t depend on one another. Where-as in case of APPLY OPERATOR the RIGHT side data set is not self-sufficient, instead the APPLY operator uses values from the LEFT side table expression to define the RIGHT side data set.